Add a recessed cockpit look! 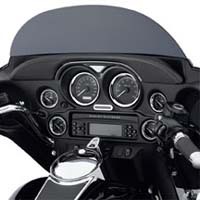 FDP-62: Original Equipment on the '06-'07 Screamin' Eagle® Electra Glide® Ultra model, this custom dash pad adds a recessed cockpit look to the inner fairing. The smooth top-stitched leather visor features a brilliant chrome plated gauge eyebrow for a custom touch. 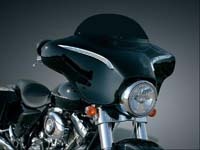 Fits '97-later Electra Glide® (including FLHTCUTG) and Street Glide® models. FDA-66: The problem with beautiful scenery on any ride is that once you go past it, it's gone. Well here's one great view that'll be with you every time you're in the saddle. 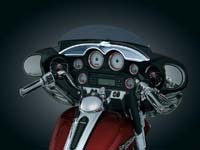 This stylized Inner Fairing Accent places the dramatic contrast of black rubber against brilliant chrome in prominent view right above your instrument cluster. You spend a lot of time peering at that dull inner fairing; here's a great view that will always be there to enjoy! FCA-95: It's no secret - most top designers in any field would concur. The keys to good looks are keeping it simple & highlighting the contours. 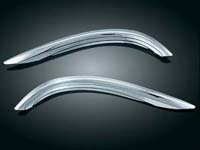 Regardless of the color or finish, chrome goes with anything & these elemental accents will add depth & character to the time-honored Batwing fairing. No tools needed & no drilling. Simply clean the surface, peel, stick & admire!